Printing instructions: The flash cards can be printed on a printer that supports two-sided printing, or you can print first one page, turn the paper over and feed it through your printer again for the second page. It is recommended to use an extra thick paper quality. You can also print the front and back pages on separate papers using ordinary printer paper and then paste them together with paper glue. 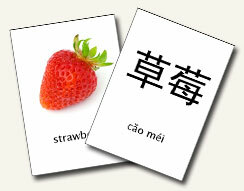 The flashcards are also available in Swedish (svenska).